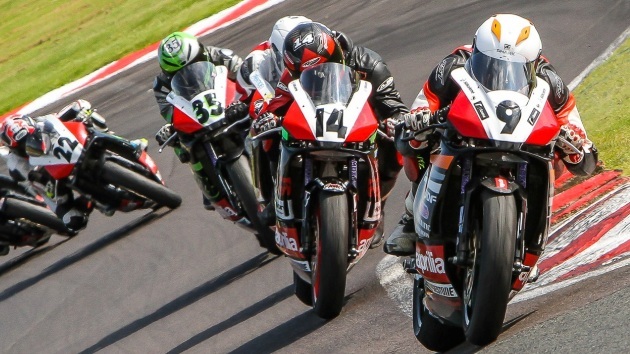 Army Reservist and motorbike racing star Lara Small clocked a personal best for a single lap when she made a guest appearance at the Thundersport GB 500 leg of the annual series at Rokingham in Corby, UK. The 31 year-old Army’s Royal Engineers captain, appearing for the Ducati 1198s Knight Road Racing Team, clocked a personal best time of 1:34:11 to finish second in the second race, with two other races happening in the day. The Ducati 1198s Knight Road Racing Team is sponsored by Magic Bike, (see link at the bottom of the page). The semi-professional Lara usually races on her Via Moto Honda CB 500, which is sponsored by a dealer going by the same name. It was thus a new battle for her to take the handles of the more powerful 1098S, which she described as a big, orange beast’ the moment she gave it the first rev. Lara finished 14th out of 26 riders overall. She also competed in the televised military race, where she finished 11th. In the two GP1 races that she took part in, she came in at 24 and 22 in each. Lara described the experience once she got the beast in full thrust on the straight as akin to being teleported, a perfect description for the zone every rider has to experience at some point in their riding career. 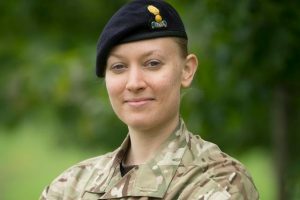 The 31 year-old is a combination of beauty and brains, juggling her reservist role with a career as team leader in manufacturing at Rolls Royce. She said dabbling in various fields serves to make her the perfect all-rounder. Craig Neve finished top at the event, with two podium finishes despite seeing his bike consumed by flames in practice. The Rockingham race has become an annual event, taking place on a 1.94-mile long International Motorcycle Circuit Circuit. It has grown over time to become the most popular series in British racing, with the greatest variety of races. The series is famous for producing some top names in bike racing, among them Casey stone, a double MotoGP winner, and former Superbike Champion Alex Lowes. Lara has been in the Army Reserves since 2005. She describes her recruitment as one of merit, adding that she did not have a family background with army links. Rather, she was driven by her own interest in the work of Reserves to apply. In a 2014 interview with British paper Mirrror, she described military training as ideal for discipline. She appreciates that the training was the same for men and women, hailing the growing number of advancing women in both her civilian and army spheres of life. The charming rider says her military experience was an added advantage when she tried out at Rolls Royce in 2012, where she now puts in an eight hour shift on a normal working day. She dedicates 27 days of her time to Reserve activity, and says given a second chance, she would make the same choices again. She says her army life is a challenge that has enriched her life. She mentions her wide travel with the reserves across Europe and America as an extra benefit that comes with her job. Still, she says, it is important for women not to lose their femininity.